For orders of £300 or above, Golfbidder now offers you the option to spread the cost of your purchase with our finance packages. We can offer a range of packages to suit all budgets and they/you aren’t restricted on the contents of your basket; whether you are buying a brand new driver and matching fairway or want a lifetime’s supply of balls, Golfbidder gives you the opportunity to make your purchase more affordable. 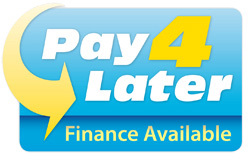 Our finance applications are completed during checkout to make it quick and easy for you to get the equipment you want. It takes a matter of minutes to set up and you will get a decision within seconds. You won’t have to start making repayments for roughly 30 days after you receive the goods – it’s as simple as that! Currently however the service is only available to our customers who are permanent residents in mainland UK and orders must be delivered to the card's billing address. So as you can see top of the range golf equipment can be yours for a nominal payment each month. As of course – don’t forget we’ll make an offer on your current clubs to offset the cost even more. To start your purchase simply click here to find your new clubs. Golfbidder Ltd works exclusively with the Close Brothers Retail Finance as lender. Our online application form typically takes a few minutes to complete. Your application is then instantly sent to the finance company and they will typically respond with their decision in around 10 seconds. Some applications may take longer to process. If for any reason we can't give you an instant decision you will be notified on screen as part of the application process and also by e-mail, with a follow up e-mail as soon as a decision is confirmed. You must be a permanent UK resident in mainland UK and able to supply 3 years address history. Employment or retired and receive a gross annual income of at least £10,000. Have a good credit history and own a debit or credit card. You must have a UK bank account capable of accepting Direct Debits. The goods must be delivered to your home address and the deposit must be paid using a credit or debit card.